Low-temperature nuclear fusion reactors, e.g. alleged cold fusion reactors. Controlled compression of fusion nuclei to overcome their electrostatic repulsion. Combination of two or more nuclei to form a heavier nucleus, a by-product of which is the release of energy. Relating to fusion at high temperatures. systems and components for producing energy by nuclear fusion reactions taking place in a thermonuclear plasma, in particular all parts related to the confinement, ignition and sustainment of the plasma. The general rule of classification in this subclass follows the IPC rules, i.e. the invention information is classified with an EC class. Reactors composed of nuclear fusion systems combined with nuclear fission systems, whereby neutrons generated by the fusion reactions are used for generating nuclear fission reactions. Reactors in which nuclear fusion reactions are initiated by heating and compressing a fuel target, typically in the form of a pellet containing the nuclear fuel. Reactors in which nuclear fusion reactions take place between atomic nuclei of a nuclear fuel in a plasma state, whereby magnetic fields are used to confine the plasma and electromagnetic fields are used to ignite and sustain the plasma. Reactors in which the plasma containment system comprises a chamber, a magnetic field generator for applying a magnetic field in a direction substantially along a principle axis, and an annular plasma layer that comprises a circulating beam of ions, wherein the internal magnetic field reverses direction. Closed-loop reactors in which the magnetic confinement is produced with a single coil system. As the helical twisting of field lines is achieved solely with external coils, the latter have to be twisted accordingly. 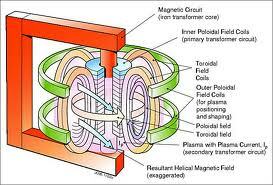 Closed-loop reactors using magnetic fields to confine the plasma in the shape of a torus with a doughnut cross-section. 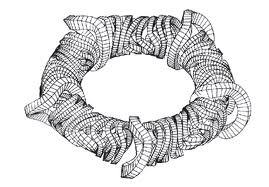 A toroidal magnetic field is generated by electromagnets encircling the torus. A poloidal field is generated by a poloidal electric current that flows inside the plasma, this current being induced inside the plasma by a second set of electromagnets. Specific components of the inertial and/or magnetic fusion confinement reactors and auxiliary systems associated, e.g. electromagnets. Systems and methods for recovering the tritium generated in the blanket of a nuclear fusion reactor. Details of the structural elements in contact with the plasma and/or affected by the fusion generated neutrons, and auxiliary systems associated, e.g. first wall cooling systems. Systems and methods for injecting the nuclear fuel targets (e.g. pellets) into an inertial confinement reactor, and the nuclear fuel into the plasma in a magnetic confinement reactor. The reactor vessel in which the fusion reactions take place, and the auxiliary systems associated, e.g. systems for creating the desired pressure conditions within the vessel. Targets containing the nuclear fuel apt to generate nuclear fusion reactions under compression, e.g. pellets for irradiation by laser or charged particle beams. All the circuits and devices used in a nuclear fusion power plant for supplying energy to the plasma energizing systems. All the devices and systems used for irradiating fuel targets in an inertial confinement reactor (e.g. lasers), and the devices and systems using irradiation methods for measuring plasma parameters in nuclear fusion reactors. Auxiliary equipments used for the construction, inspection, maintenance and repair of systems and components of nuclear fusion power plants. Systems and components for producing energy by nuclear reactions not involving the generation of a thermonuclear plasma, e.g. fusion reactions. Systems and methods for inducing fusion of hydrogen isotopes by diffusion in a host matrix, or reactions of hydrogen isotopes with the nuclei of a host matrix at ordinary temperatures. Systems and methods for inducing fusion of hydrogen isotope nuclei by using the catalyzing properties of muons in a hydrogen isotope environment. Systems and methods for promoting nuclear fusion at ordinary temperatures using a beam of particles reacting with other particles or with a target. Systems and methods for promoting nuclear fusion of a (gaseous, liquid or solid) target by subjecting it to pressure or shock waves.